Great men have always been driven by the prospect of victory, from battlefield generals, to friendly competitions over who can eat the most General Tso's. 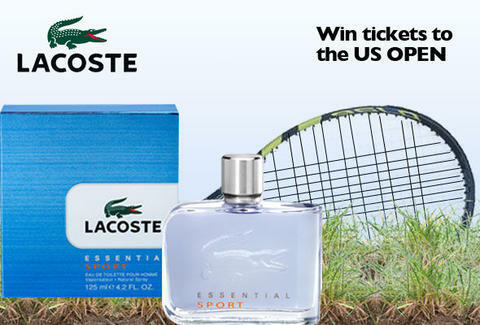 Now, score your own glorious triumph, in Queens: enter the Lacoste Essential Sport US Open Sweepstakes. Lacoste Essential Sport, designed to project the very essence of a winner in the lead, is offering Thrillist readers a shot at two choice seats for the first round of the season's final Slam, where you'll witness the prowess of the world's most elite tennis pros as they slug it out in the world's largest tennis stadium, thankfully no longer wearing the world's tiniest tennis shorts. To smell like a champion even while sitting in the stands eating ice cream, dab on a few Essential Sport droplets. Hitting you with more freshness than an ice-cold ammonia towel, the scent rests on a 12-deep lineup of notes, from vetyver, to nutmeg, to frosted ginger. Claim your victory without having to eat your weight in crispy, red nuggets: enter here to win two tickets to the US Open.